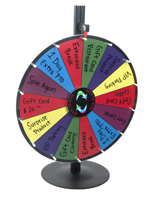 Looking for a fun promotional tool that’s easy to customize? 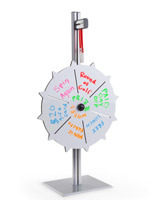 These dry erase prize wheels only require a writing utensil for creating a custom game. 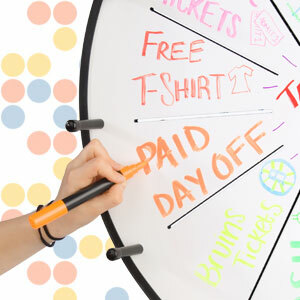 They can be used for rewarding employees, visitors or students with gifts and services. 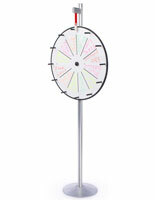 Each tabletop or floor stand has a spinning disc design that shows contestants what they can win. 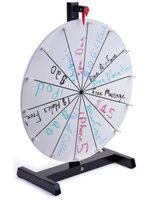 These include blank slots that allow users to write or draw anything they want. With wet erase markers or liquid chalk, anyone can a make a vibrant attraction with exciting opportunities for players. 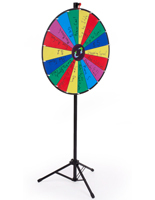 Spin-the-wheel games like these bring customers into retail stores with their lively color displays. 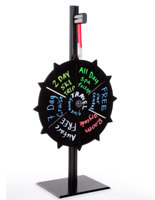 Each customizable fixture gives storeowners a way to attract passersby with special deals and offers. 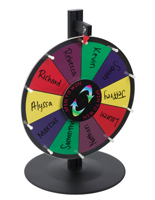 These write-on prize wheels, or carnival spinners, feature a collapsible design that allows them to be easily transported to trade shows, meetings and other events. Each fixture has different features that make it unique and suitable for any situation. 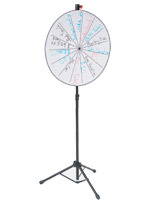 What options are available with these spinning disc attractions? 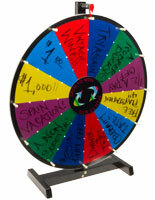 Dry erase prize wheels can feature backing boards of different colors. Stands with black surfaces are great for contrasting lighter erasable markers, while white surfaces look great when they match darker shades. 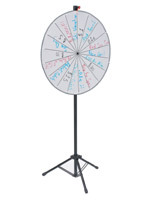 Some models have a colorful board that is easy to notice no matter what color utensil is used. 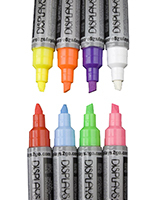 Our website offers compatible dry-erase, wet erase and liquid chalk markers that are ideal for any type of backing surface. 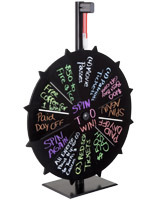 These spinning prize wheels also come with different placement options. A few units have a small stand designed for tabletops, but they still have a large viewable surface. Others feature a floor standing support that remains stable even in high traffic environments. The third option includes attractions with an adjustable pole or extending legs that can be used in either position. Units with a telescoping support have a folding tripod design that makes them even easier to pack up and move. 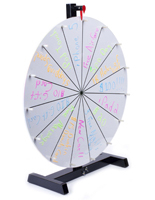 These wet erase prize wheels are available with different numbers of slots. The amount of sections on each game can range from (6) to (18) to meet the needs of any school, office, church or community center. Smaller models can be customized to have (6) or (12) slots, giving them an extra dimension of customization. 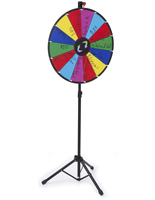 Write-on wheels like these can also feature a different “clicking” noise level. Each fixture includes a clicker that creates sound for adding excitement. 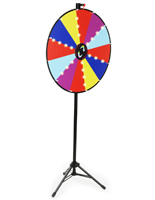 These noise makers attract attention and can draw visitors to a booth at an event. LED displays feature are great for grabbing the interest of passersby at trade shows and exhibitions. These have a board with animated lights that move in a “bursting” pattern. The controls are simple, one switch controls whether the device is on or off, and another modifies the speed of the moving LEDs. For power, each spinner comes with a cord that plugs directly into any wall socket. A lithium ion battery that lasts for (12) hours is also included that is sure to last for the duration of any trade show or other event. 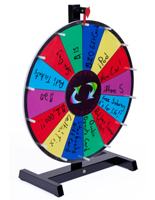 Contest wheels for dry-erase markers like these are ideal for a number of locations. 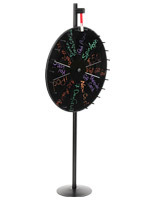 At home, parents can make assigning chores fun by spinning one of these carnival discs. 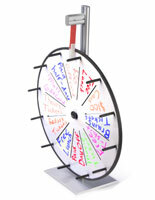 Wet erase spinners can be used in the class room for fun trivia games that help students prepare for quizzes and tests. Nursing homes, community centers, churches and non-profit organizations can also use them to create entertaining attractions. 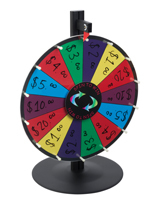 Carnivals and county fairs can raise funds by using spinning color boards to hold pay-to-enter contests. 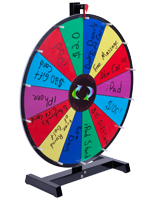 Order before 3PM EST to get quick same day shipping on these exciting displays on PrizeWheels2Go.com!